The Ingleside Police District encompasses the area south of Cesar Chavez Street to the San Mateo County line, and area west from Highway 101 to Faxon Avenue. Originally built in 1910, Ingleside Station, located just off Balboa Park at San Jose Avenue, underwent a complete renovation while retaining its classic Mission style exterior of stucco and red tile and reopened in 1991. In the Department’s continuing efforts at community outreach, the station includes a community room that can accommodate 50 person, visitor parking and handicapped access. The Ingleside District is home to many long-standing neighborhoods, including Sherwood Forest, Mt. Davidson, Westwood Park, Miraloma Park, Glen Park-Sunnyside, Diamond Heights, Bernal Heights, Upper Noe, Mission Corridor, the Excelsior and St. Francis Wood, New Mission Terrace, Crocker Amazon, St. Mary's Park, Silver Terrace, Portola, Sunnydale, Visitacion Valley, Precita Park, Cayuga, Outer Mission, and Holly Park. San Francisco City College is located in this district also. 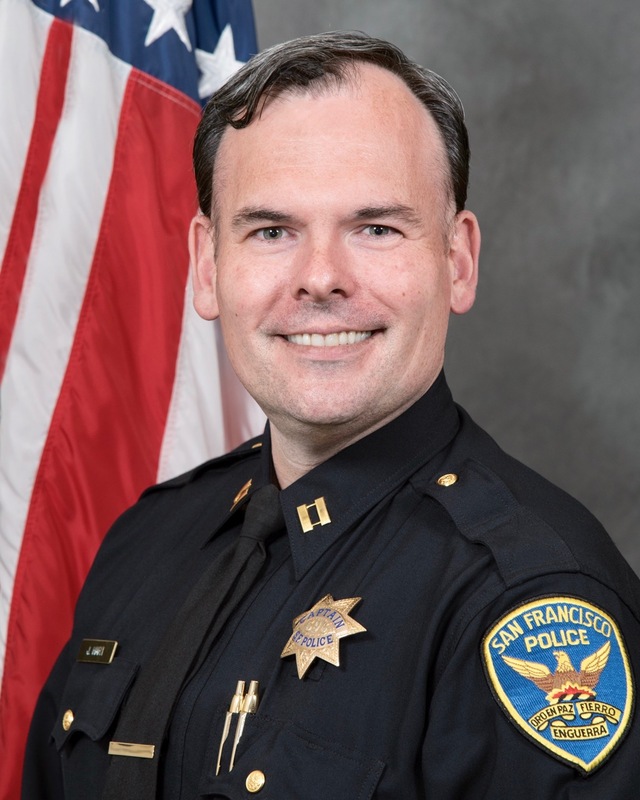 Captain Jack Hart joined San Francisco Police Department in 1999 and has served in patrol assignments ranging from as a field training officer to as an attorney with the Department's Legal Division. As a California POST-certified instructor, he has taught constitutional law, criminal law, criminal procedure, and leadership courses to over 50 recruit classes. As a Sergeant, he led a street-crimes plainclothes enforcement team in the Bayview district. As a lieutenant, he was the officer-in-charge of the Candlestick Park detail, where he led the team of over 100 police officers policing over 70,000 people. As the captain assigned to SFPD's Homeland Security Unit, he was in charge of the Marine Unit and led the Department's mutual-aid response to the 2017 North Bay firestorm at the Department Operations' Center. Captain Hart is also a master instructor in the police leadership development course called "Blue Courage," where he has inspired police officers of all ranks in large and small departments across the country. Meetings are subject to change. Community Updates are an information newsletter to inform the Ingleside residents of incidents occurring in the district.